Five years in development, this book is a timeless resource for families, with great, well tested recipes and informational sidebars throughout. The sidebars contain practical wisdom and inspiration from real families' experiences. Originally published by Zondervan, now from Suitcase Books. The Zondervan Family Cookbook makes an excellent personal gift for many occasions, and an ideal promotional gift for Realtors and others serving families. To visit a special site featuring The Zondervan Family Cookbook, including selected holiday recipes click here. 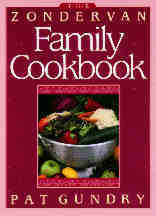 To purchase The Zondervan Family Cookbook from Amazon.com click here. For information about volume discounts from Suitcase Books click here. The most widely read of Pat's books, this one is a favorite of pastors and others who routinely give it to couples about to be married. To purchase Heirs Together from Amazon.com click here. Based on the Proverbs 31 chapter portion about the Virtuous Woman, The Complete Woman was originally published by Doubleday, reprinted by Ace, Jove, Zondervan, and now available from Suitcase Books. This title is temporarily out of stock at Suitcase Books, until reprinted. Meanwhile, please visit the vendors below for used copies. Named by Christianity Today as one of the most influential books for Evangelicals in the last 40 years. In this compact, readable volume Patricia Gundry identifies the barriers that have traditionally restricted women to second-class citizenship in the church. She then examines each one in the light of sound principles of biblical interpretation and provides clear and concise information that supports equality among all believers. In print almost continually since 1977, originally from Zondervan, now published by Suitcase Books. To purchase Woman Be Free from Amazon.com click here. How to deal with the pressures of being a changemaker. How to make changes ecologically. How to understand the women who are making the changes (an open letter to men who wonder what happened ). This title is temporarily out of stock while being reprinted. Meanwhile, used copies (eith a different cover image than above) can be purchased from the vendors below. by "A Master of the Instrument"
Long out of print, now published by Suitcase Books. ISBN 1-882169-06-9, hardcover, 143 pages, $38. A quality hardcover reproduction of an early 20th Century violin making classic.This comprehensive work contains invaluable insight into the history, construction and techniques of violin making. It includes many useful diagrams, illustrations, measurements, and varnish recipes. This mysteriously authored classic has been a sought after book, long out of print. I wanted to make it available again, reproducing it in a sturdy, quality hardcover edition very close to the original in appearance. It is an essential addition to any personal or professional library that includes information about the violin or musical history. The original cover lists its creator only as "A Master of the Instrument." 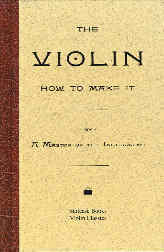 The preface states, "That this modest volume challenges no criticism, is plain, from the fact that the author is not in search of fame, but aims only to produce a work written in language so plain as to be readily understood by all lovers of the violin, high or low; a book free from ambiguities, and that kind of language which conceals ideas....The author's information has been derivied mainly from his own experience, corroborated by the communications and opinions of many others of such standing as to give high value to their authority. He feels, therefore, that he is justified in placing it, with modest confidence, before those who are in a condition to require it, without any hazard of leading them astray, and with an earnest desire that it may prove useful. That this little work may enable the inexperienced mechanical amateur to understand the construction of the instrument in a general sense, and that it may also convey such practical information as will render the unskilled purchaser capable of judging intelligently and independently of the merits and demerits of instruments, is the author's fervent wish." Bow-instruments exist form a very early date, some of which approximate closely in form to our modern Violin, whilst others are of the rudest description, but still possess one important distinction from other stringed instruments, viz., that of being played upon by a bow, as those truly possess a character and quality essentially their own. Among such instruments may be ranked the following, although a great many more might be enumerated: The Ravanstron of India and Ceylon; the Rouana of the same countries; the Urh-heen, or Fiddle of china; the Omerti and Kemangeh-a-gous of Arabia and Persia; the Rebab, also an Arabian instrument; the Goudok of Russia; the Soorunga and Tarau, or Thro, of the Burmese Empire; the Koba of Tartary; the single-stringed Violin, or Mono-chord, of Egypt; the Fidla, Langspel, and Sumphion of the Icelanders; the Gue of the Shetlanders; the Guhue of Africa; the Crouther, Crwth, or Crowd, of Scotland, Ireland, and Wales; the Linterculus; and lastly, the Viol species, which bear the nearest resemblance to the Violin proper.